I am not sure if I said this before, however, this just must be the absolute, 100% best embroidery foot I have used. The control you have, even with the free-motion is astonishing! At first glance, it was nothing at all like I had seen before - so of course I needed to have it and give it a whirl. I was curious as to the purpose of that long bar at the back of it. 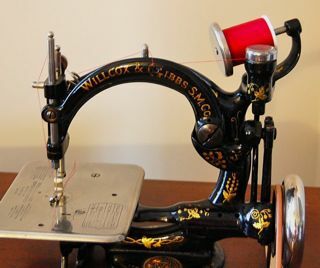 Now that I know what it does, and how it works, I am amazed once again at the inventiveness of our earlier sewing inventors! This does fit a low shank sewing machine. Now, I am not sure if it fits all of them because the bar at the back plays a crucial role in the mechanism and how it works. Place it on the machine in place of your regular presser foot. From the front, you can see the long bar going up the back. (see notes below from Australia - I tried it on my Singer 221, and should have said that. She tried it on several other low shanks - doesn't fit all and so glad to hear what she ways). This photo shows the back with the presser foot bar in the up position. Look directly below the presser bar and you will see a small notch. The next photo shows the presser bar down. It will only go to the top of that notch - not all the way down as when a regular foot is on the machine. This gives it that "bounce" it needs and keeps the actual embroidery foot from touching the fabric - at first. There is a lever in the back that you lift up with your finger. This will lift the foot up and give you enough clearance to place your hoop or quilted fabric under. Nice touch! Looking at the next two photos will give you an idea of how it works - oh, I just have to get the video camera on this one! 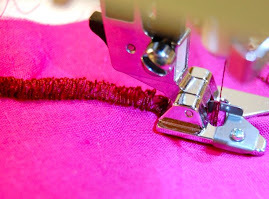 With one stitch, the foot goes all the way down to the fabric. With the next stitch, it pops up. This gives it support when it is down, but the ability of free-motion when it is up! A simple wonder for sure! When I have used other embroidery attachments, the foot stays the same distance away from the fabric the entire time. It takes a lot of practice to gain the right control of the foot and the movement. With this embroidery foot, there doesn't appear to be that wobbly lack of control. Does that make sense? I followed the pattern in the fabric and then did a quick free-motion to make the name - almost effortlessly! Now that I know how it works and why the bar is so important, I have another mystery to solve. This one small attachment actually has three different part numbers on it! I can see nos. 161234, 161236, and I believe the last number is 161235. This last number could also be 181235 - my numbers aren't all that clear. So far I haven't found any Singer record of this embroidery foot/attachment so if you have any information, have seen it, or used it - please, please let me know! 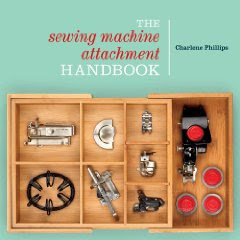 I love researching our older sewing attachments. I didn't show you the quilting it did, but was just as gorgous as the free-motion embroidery! I think a great combination is this foot and the Singer embroidery book. 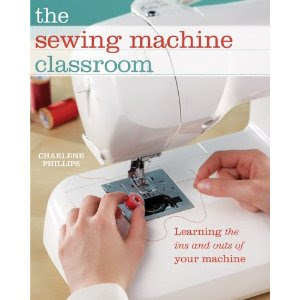 Between the two, I will now continue on with the sewing lessons in the book. Having a wonderful time exploring and learning! I'm off to try it on my 201,99 and 206. Ok back again. Alas it does not seem to fit on any of them. There is every chance I'm doing something wrong of course. On the 201 the long bar at the back is directly below the presser bar lever and you can not lower the presser bar at all. On the 99 it is to one side as shown but its the wrong side. On the 206 it is also directly below the presser bar lever but unlike the 201 you can lower the presser bar. You just rest it on the top of the bar, not the notch on the side. However when you lower the needle it rubs against the inside of the hole in the foot. Thanks for letting me know how it fits on those machines. It is always interesting as to how and why Singer did for some. It is a very specific fitting sewing attachment. Will be interesting to see if it fits on myour mother's 319. I just love this attachment though. The control I have is fabulous! Good evening. I happened upon your website by chance and am so glad. 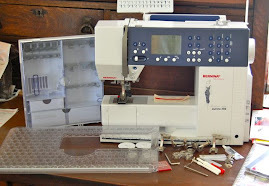 As far as the Singer Embroidery Attachment is concerned, I own one for the 221/222K. With the 221 you need to use a plate, but with the 222K you simply drop the feed-dogs. This attachment does not require a bar. The part number is 171071 and was made by Simanco. Upon looking closer, I see that my foot's appearance differs from yours in (that I can see) three specific ways. My "leg" is long and straight whereas yours steps down; the "foot" at the bottom of the "leg" on mine has a very small, round opening whereas yours appears to be oval; and the neck of the bar to the left of the spring (that looks like a duck's head and neck) is long on mine and short on yours. I have to go to Houston tomorrow, but I'll send a picture when I can. So glad you found the blog! Your embroidery foot #171071 is indeed different from the #161234 (35, 36), and you are right it doesn't have the long bar. I have one in my stash, along with the embroidery hoop Singer made for it. It is a nice set for the 221 & 222s. Yes, please send a photo to share with others. Love seeing what everyone has in their attachment stash. You described the differences in the two feet nicely. I pulled all my embroidery feet out and placed them side by side to look at the subtle differences. I will take a photo and add to the blog site. Love the comparisons! I have used each one on my featherweight, some on other machines. 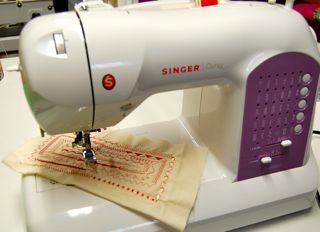 I have been experimenting with free motion embroidery without any feed cover plate, and having great success on the Singer 221. Don't you just love these!? "attachments are like friends - you can never have enough." Wow... I have been researching the singer foot 161236 myself and just came across your blog. I know it's 2012 but I didn't see an answer so here is what I have found. 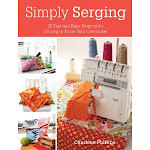 On page 77 of the Singer 320K2 manual it describes script stitching and how to use the Darning and Embroidery Foot No. 16236. The Singer 320k2 is a free arm 319k so I assume it will work on the 319k as well....but you know what they say about assuming!! Here is a link to the 320k2 manual. http://tinyinc.files.wordpress.com/2010/05/singer-320k21.pdf I just love researching old attachments. Never too late to share information! Wonderful link Troy.